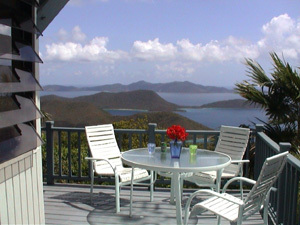 Tree House is high on Mamey Peak, with great views to the north of Jost van Dyke and Great Thatch and east over the East End of St. John and the British Virgin Islands of Tortola, Virgin Gorda and Norman, Salt, Cooper, and Peter Islands. The atmosphere of the home is casual and informal and children of all ages are welcome. There are short interior staircases. Ceramic tile floors, painted wood and tropical prints create a cool and comfortable interior. The kitchen has a refrigerator with ice maker, full gas stove, coffee maker, blender, microwave and toaster oven. There is a gas grill on the deck off the dining room. There is satellite television, DVD, VCR, stereo system with CD, and phones with an answering machine and DSL. Tree House is fully screened with fans in each room. This breezy home has three bedrooms. A bedroom with a king bed is on the same level as the kitchen and dining room, off the main deck. The main entry is one level down and also has a queen bedroom and two bathrooms, one a full bath and the second a half bath. On the lower level, off the hot tub deck is a large bedroom with two twin beds, which can be made up as a king. This bedroom has an adjacent half bath. There are pull out couches for extra sleeping in the upstairs living room. The lower level of the home has a large sitting room, with a full laundry and an additional shower. Step outside onto a private deck which has a large, heated spa that seats four comfortably. Beach chairs, beach towels, umbrella, coolers and masks and snorkels are provided. Relax, lounge on the deck and enjoy the sun or our magnificent sun and moon rises. Watch the banana quits and humming birds coming to the deck for their sugar fix. 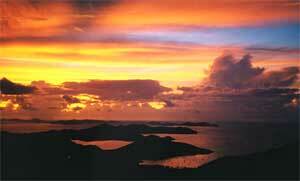 Tree House is located in the center of St. John which makes it a great location for exploring the whole island. Not too far from anything! Tree House sleeps six plus. Tree House is six miles from Cruz Bay on a Centerline Road. There is a short roughly paved access road. North shore beaches beginning with Francis and Maho Bays.